Whisk or just thoroughly stir together the rye flour, all-purpose flour, baking powder, sea salt and baking soda; set aside. In the bowl of a stand mixer fitted with a paddle attachment, beat the butter and both sugars together on medium speed for 4 minutes, scraping the bowl occasionally. Beat in vanilla (if using). Add the egg, and beat 2 minutes more. Turn off the mixer and add the dry ingredients all at once, then stir on low speed, pulsing so that you don't overbeat, until flour is almost fully blended. Add poppyseeds, cranberries and chocolate and stir until blended. At this point, I liked to dump the dough onto a pastry mat and just push it all together, but you can do it whichever way feels comfortable to you. Divide the dough into 15 pieces and roll each piece into a ball. Cover and refrigerate the dough overnight or for up to 3 days. Arrange the cookies on the sheet, leaving 2 inches between each cookie. Sprinkle tops with a little Maldon salt (if using). Bake the cookies one sheet at a time on the center rack for 10 minutes. Pull the baking sheet from the oven and using something flat like a spatula, tap the tops so they are flat. This is supposed to keep the cookies chewy ( a trick Moko learned from David Lebovitz). Let the cookies rest on the sheet for 3 minutes, then carefully transfer them to a rack. Bake remaining dough. 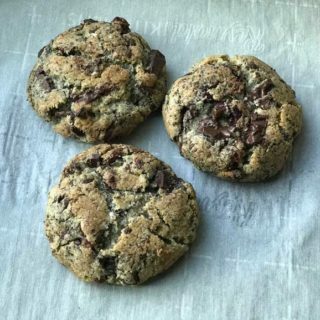 Allow the cookies to cool for at least 10 minutes before serving.